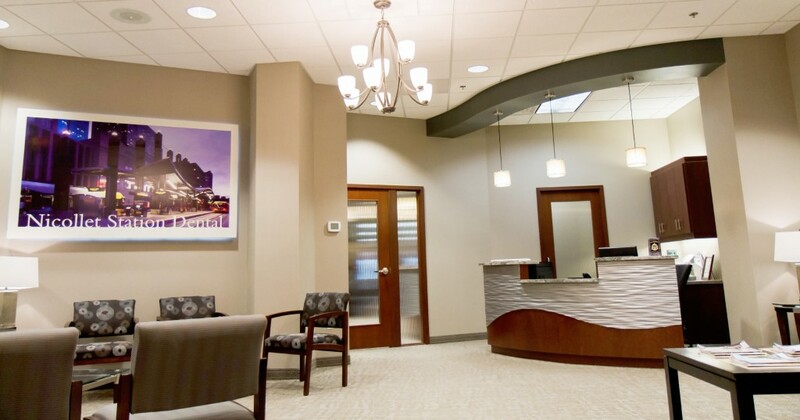 At Nicollet Station Dental, it is important to us that your experiences at our office be enjoyable. We offer bottled water, a variety of coffees and teas, a comfortable reception area, televisions in the ceilings of every treatment room, pillows, blankets, and hot towels for freshening up after dental treatment. Digital x-rays reduce radiation and give instant diagnostic radiographs. Intra-oral cameras allow you to see what your dentist sees on an overhead monitor. Diagnodent laser instruments help detect decay that is not visible on an x-ray or clinically. Televisions above each dental chair, nitrous oxide gas, and headphones are available to help your time in our office fly by.